Wilkinson Cleaning Contractors has been one of Yorkshire's premier providers of commercial ladderless window cleaning solutions for over thirty years, offering a reliable and regular service covering the whole county. Our window cleaning contracts range from small, residential blocks to large, commercial buildings and encompass clients of all kinds, including schools, hospitals, retail outlets and industrial premises. We use the latest water-fed pole technology, enabling us to clean even high level windows safely, efficiently and economically. In addition to window washing, Wilkinson's also offers other facilities management services such as commercial painting, snow clearing and gritting, grounds maintenance, jet washing, cladding restoration, graffiti removal, business cleaning and gutter clearance. We guarantee to find a cost-effective solution for any cleaning requirement you may have! We're very friendly and realistic in our approach, so please contact us to discuss your individual needs or request a free quote. 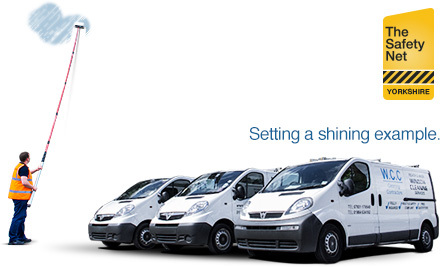 We're based in York and regularly cover the whole of Yorkshire - north, south, east and west. We're also happy to travel further afield for larger commercial clients and have worked in Manchester, Newcastle and the Lake District.